Navodaya 9th Class Entrance Exam 2019 Admit cards: JNVST Navodaya Vidyalaya 9th Class Entrance Test 2019 has been issued by the NVS Hyderabad in the month of October 2019. Jawahar Navodaya Vidyalaya Samiti invited applications from the eligible candidates for admission to Class IX of Jawahar Navodaya Vidyalayas of the District, against the vacant seats, which are likely to be available during the academic year 2019-20. The admission is through an All India Entrance Test to be conducted on 02-02-2019 by 10.00 AM to 1.00 PM. in Jawahar Navodaya Vidyalaya of the district concerned. The medium of test is English/Hindi. Result of the Selection Test will be notified in the Vidyalaya Notice Board as well as published in selected local newspapers. Selected candidates will also be intimated by post. All the eligible Students were applied for this entrance test notification. Who were applied for this stream they are waiting their hall tickets of JNV Entrance Test. How to download Navodaya Vidyalaya Exam admit card for Class 9 lateral entry test. Visit the official website of Navodaya Vidyalaya. Click on the scrolling link on the homepage that reads ‘Download admit card for class 9 lateral entry test’. A new page will be displayed. Fill in your username and password and submit. Your admit card will be displayed. Download and take its print out. Navodaya 9th class entrance exam 2019 Admit Cards for Navodaya 9th class entrance exam 2019 date which will be conducted on 02/02/2019 by 10 AM to 1.00 PM. 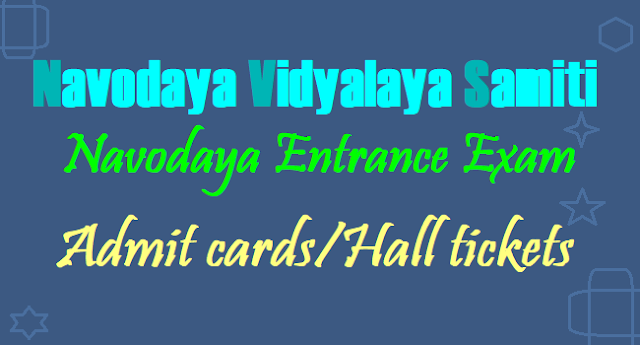 Candidates can download their Hall Tickets in the following link at https://www.nvsadmissionclassnine.in/nvs/homepage OR Navodaya Entrance Exam 2019 Hall Tickets have been sent to all the MEO/BLOs by District Educational Officers. So Candidates can obtain the Hall Tickets from the MEO/BLO Offices OR Candidates may download the admit cards from the official website. Navodaya Admit Cards: Admit Card for appearing at the Selection Test will be issued to the candidates by 01-01-2019. If the candidate does not get the Admission Card, he/she must contact the office of the Principal of Jawahar Navodaya Vidyalaya for obtaining the same. The selection test contains questions from the subjects of Mathematics, General Science, English and Hindi. The total duration of the exam is three hours. The subjects include English, Hindi, Maths, Science carrying a total of 100 marks. The question paper will be in Hindi and English. The examination will be of two and half hour duration from 10 am to 12:30 pm. Students will have to answer in OMR sheet. Navodaya Vidyalaya Exam Admit cards released for Class 9 lateral entry Entrance exam. Navodaya Vidyalaya Samiti (NVS) has released the admit card for the class 9 lateral entry Navodaya entrance exam. Candidates who have registered for the exam can download the admit card from NVS official website - nvsadmissionclassnine.in. This lateral entry NVS exam is scheduled to be conducted on February 2, 2019 from 10.00 AM to 12.00 PM. The center of the exam will be in Jawahar Navodaya Vidyalayas (JNVs) of the district concerned. The Central Board of Secondary Education (CBSE) conducts this lateral exam for filling up the vacant seats in class 9.